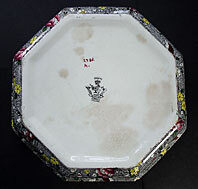 "A very attractive collectable Staffordshire art deco pottery chintz pattern on an octagonal deep dish. 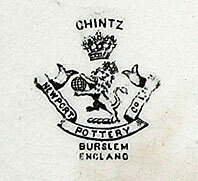 It was produced around 1925 at the Newport Pottery, Burslem, owned by A.J. Wilkinson - best known as the Clarice Cliff maker. The design does not appear to be recorded in any chintz literature and is actually called Chintz as the pattern name not just a generic term. This suggests it may be the first chintz pattern to be made by Newport/Wilkinson. Chintz is a striking multicoloured lithographic pattern with birds in flight which is particularly successful. 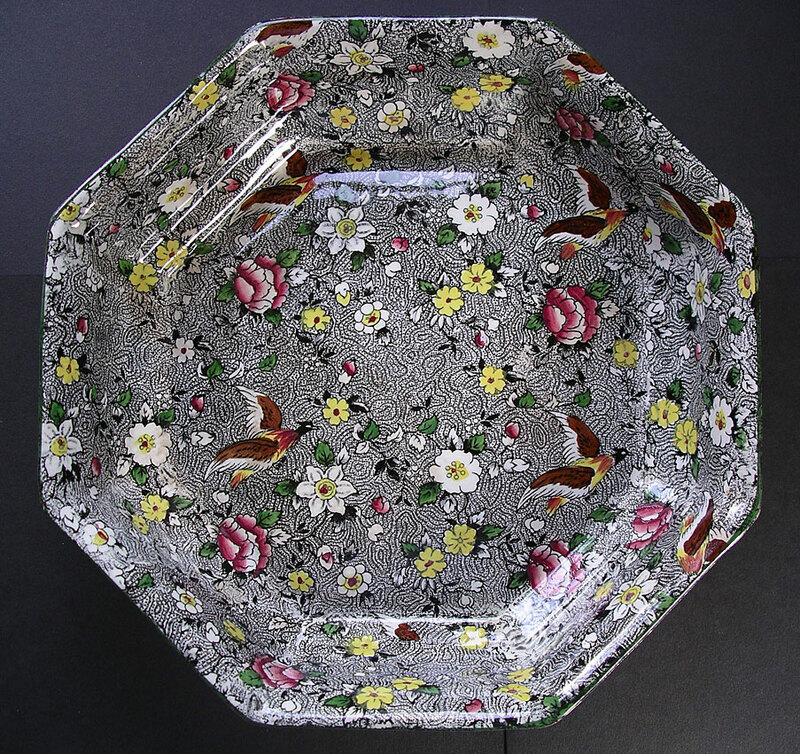 An important rare design that epitomizes the best of English Staffordshire chintz art pottery." Antiques Expert Hamilton Bear. Dimensions: width 245 mm max. a shade over 9 1/2 inches. Mark: Newport Pottery printed mark and hand written pattern number as illustrated. Condition: A very good display example and a rare survivor. Condition report: There is typical light crazing to the reverse and some patches of staining through use. This is quite well hidden in the all over design on the front. There is also one flat chip to the underside rim at 10.00 o'clock which hardly shows from the front.